Paint sprayers make it simple to finish any paint job in a fraction of the time without worrying about messy rollers, brush lines, dripping paint, or the hassle of trying to evenly coat various surfaces. While the average DIY hobbyist is usually satisfied using an entry-level spray gun a few times per year, HVLP paint sprayers (high-volume, low-pressure) are made for the pros that use them often, and they pay for themselves the first time they use them. You'll get years of use from these professional-grade models, and enjoy fast painting speeds with the accuracy you'd expect from high-quality engineering and durable construction. What are HVLP Paint Sprayers? 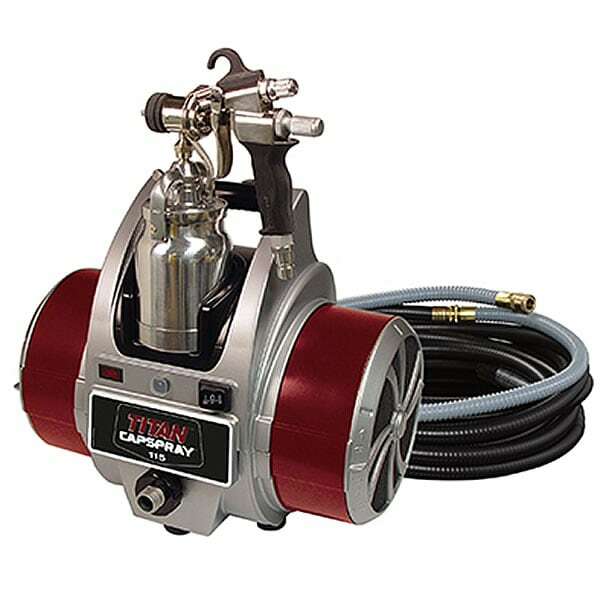 With the hardworking contractor in mind, HVLP paint sprayers (sometimes called turbo-sprayers) are professional paint-spraying equipment ideal for use on trim, finish work, furniture staining, cabinet painting, and any detailed applications where high-accuracy, speed, and a smooth finish are needed. By using a higher volume of paint and lower air pressure, HVLP guns can reliably control the even-spread of the paint and save you money by minimizing wasted paint from overspray and paint splatter. You'll also save time by not having to clean up your lines. How Do HVLP Sprayers Work? 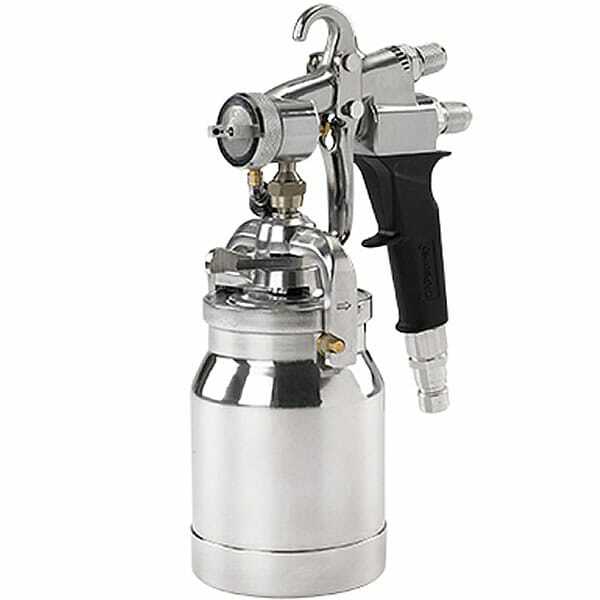 All HVLP spray guns "atomize" the paint, which means when it comes into contact with the air stream released from the spray gun, the paint is separated into tiny particles as the air is blown out of the nozzle. HVLP sprayers have limitless control from small to large fans, and controls for spray density, from mist to heavy coat. 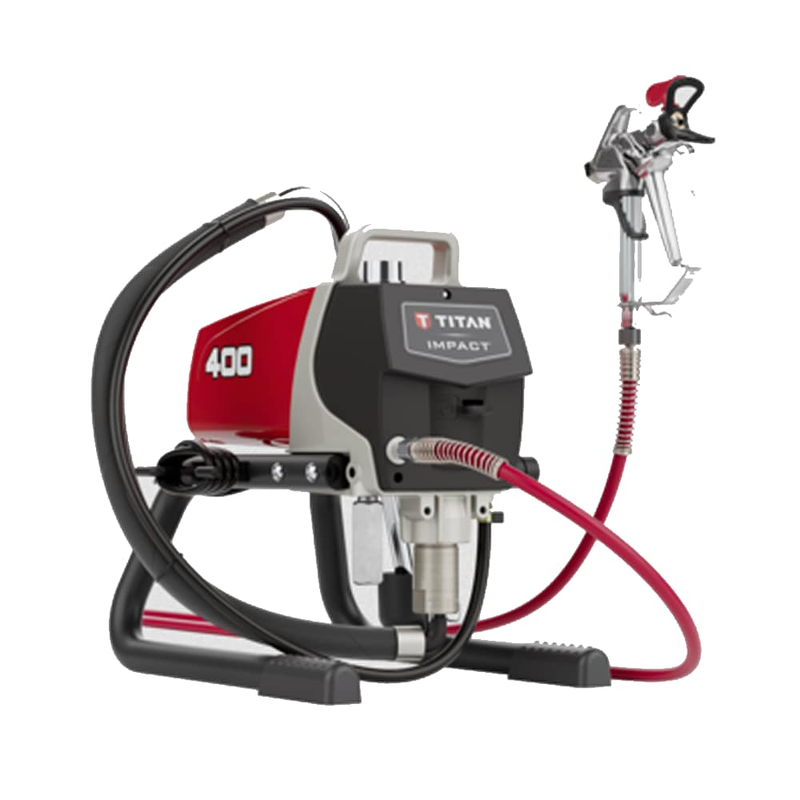 These sprayers have air flow and paint volume controls, a paint basin, an air inlet, and a nozzle that helps control the pressure and spread of the paint being sprayed. 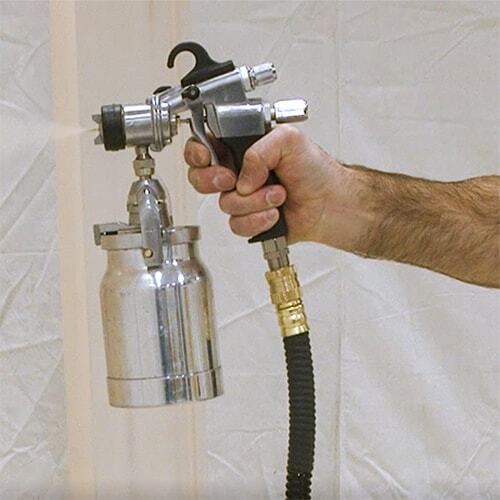 When the trigger on the spray gun is pressed, the paint is released into the air stream, atomized, and is shot through the nozzle at the desired pressure and spread. The result of a properly-set HVLP gun is a fast, even coat with virtually no wasted paint from overspray. What are the Benefits of Using HVLP Paint Sprayers? 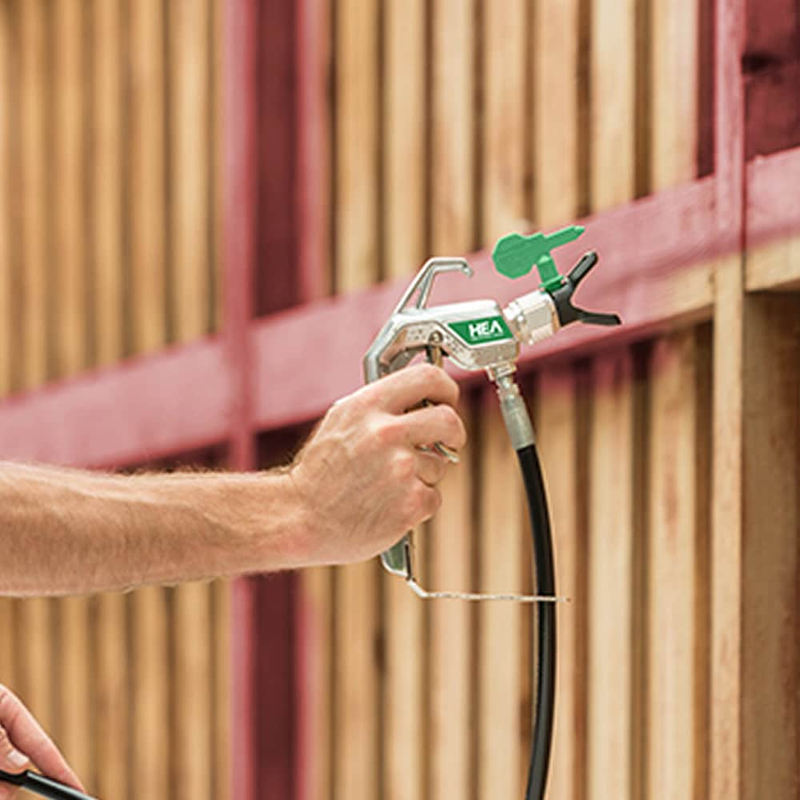 The benefits of HVLP sprayers are that they can atomize paint faster, more accurately, and at a lower pressure than traditional paint guns, creating a softer, more even spray—so you can cover larger areas faster without as many touchups. Plus, the lower pressure also minimizes air pollution. From a commercial perspective, HVLP spray systems are widely used in the automotive, marine, furniture finishing, and decorative industries where high-quality paints, stains, and finishes are used in large quantities all-day-long. The automotive and furniture industries used to use conventional spray guns under heavy pressure but later switched to HVLP because of the increased efficiency and additional benefits that HVLP offers. Contractors and professionals love HVLP sprayers because they also minimize wasted paint from overspray, which saves them money on paint costs. Because of the quality, durability, and speedy performance of HVLP professional spray guns, they are the sprayer of choice for most auto body and repair shops. What's the Difference Between HVLP and Airless Paint Sprayers? As you can see from the chart, there are many differences in both application and performance, but the most obvious differences are in the delivery of the material to the substrate being coated. HVLP paint sprayers use an onboard turbine or separate air compressor that keeps the paint and air power separate until they meet just outside the point of spray (nozzle) where the paint is atomized. You can customize the spread, volume, and pressure of the paint being sprayed using controls on the gun. Unlike airless sprayers, they don't rely on heavy pressure to make paint spray, giving you the control you need for finely finishing projects without paint splattering everywhere while still doing detail work quickly. 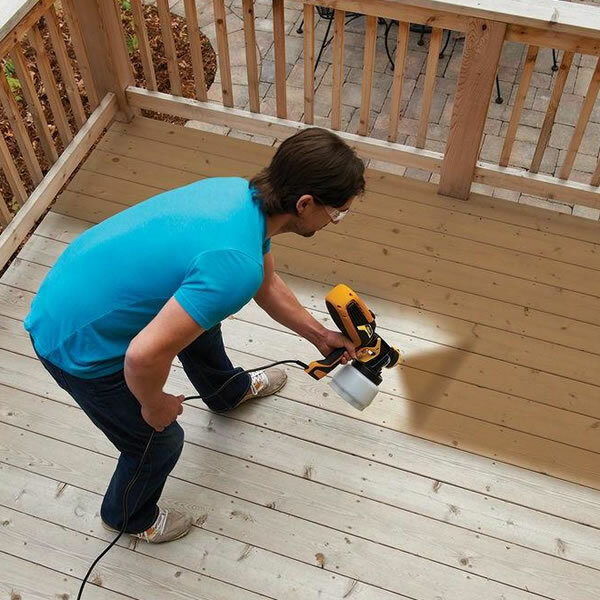 For example, you can use an HVLP sprayer to apply latex paint to interior baseboard trim or stain furniture in your home, but an airless sprayer is best to apply stain or thick polyurethane to a large fence or deck. Also, HVLP sprayers can actually store paint in separate canisters for a period of time, while airless guns and hoses need to be cleaned out completely after each use. 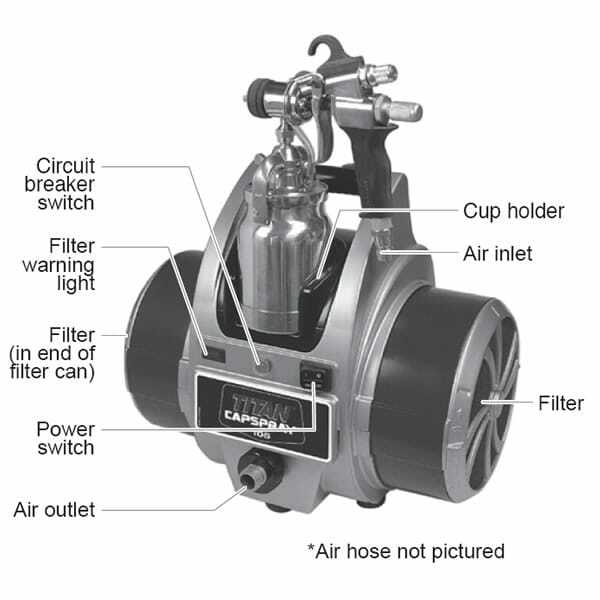 Airless paint sprayers don't use an air mechanism like a turbine or an air compressor. Instead, they use an internal piston pump that pressurizes the material directly and then sends it through a hose that attaches directly to the spray gun. When the pressurized liquid exits the nozzle, it is forced to atomize as it splatters against the spray tip. That high pressure against the spray tip is what breaks up the paint into the atomized particles used for painting. As such, they are meant to spray large surfaces and at full power at all times. Airless sprayers are used when you need to cover large surface areas at high volumes when fine detail doesn't matter as much. They apply thick, heavy coats quickly but this comes at the cost of increased overspray and larger droplets during application. Because these guns operate at a much higher pressure, they can often use thicker paint straight from a can without filtering or reducing the paint first. Do I Need an HVLP Paint Sprayer? Professionals know the biggest cost in their industry is labor and time. HVLP and turbo-sprayers were designed to be the best of both worlds, combining the power of an airless system with the accuracy that only HVLP sprayers can provide. Using an HVLP paint spraying system over regular sprayers saves you time, increases your efficiency, reduces overspray, and reduces the chance you'll have to spray an area twice or deal with uneven coatings and splatter. As contractors enter the field, they may gravitate toward airless guns first because of high volume and higher pressure, but often times they realize they need a specialty gun (HVLP) for detail work on their jobs when airless guns won't cut it. While airless guns are usually less expensive, they are generally viewed as a more "consumable" product, and you'll likely need to be replaced sooner than an HVLP spray gun, (especially if you forget to clean an airless gun and hose after each use). HVLP sprayers are designed to last under heavy use and enjoy the longevity that lower-pressure operation provides. And, you might be surprised about how many uses an HVLP sprayer has. So stop worrying about dripping paint or the hassle of trying to evenly coat your surfaces. If you're ready to save time and money with professional equipment and spray paint like the pros, check out HVLP paint sprayers below. Professional HVLP Paint Sprayers Explained.. Our Power Equipment Direct how-to library can help you learn about Proposition 65 Product Labeling, Sales Tax Information and Product Recalls for Pressure Washer Equipment.